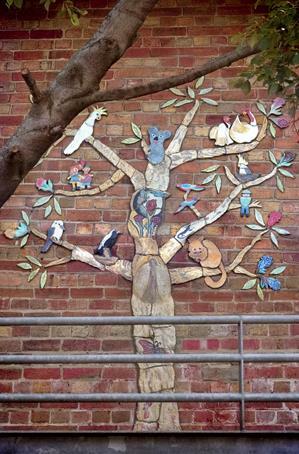 I had the good fortune to be work on a “Tree of Life” public art project which brought together community housing tenants and members of the wider community. 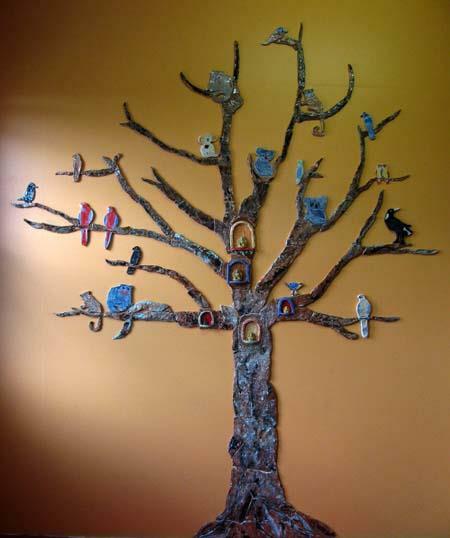 We designed and made three ceramic tree murals as part of Housing Week 2009 and the project was supported by the State Government of Victoria, South Port Community Housing Group, Gasworks Arts Park and facilitated by Martin Foley, the State Member for Albert Park. It was fantastic to have everyone supporting me to create the trees at three of the SPCHG’s rooming houses. The process proved to be a lot of fun and the making days include a BBQ really adding to the flavor of the occasion. 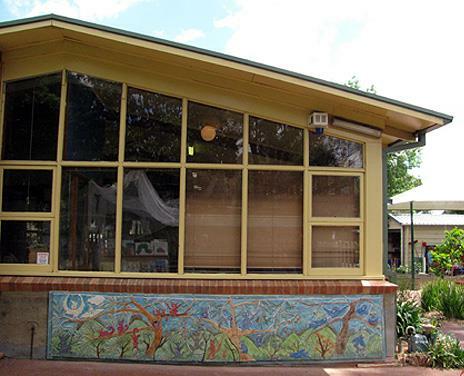 The project received funding from The Office of Housing, Vic health and the City of Port Phillip and was auspice through the Gasworks Arts Park. Catherine Acin documented the project and is responsible for the images below. The ceramic mural commissioned for Blackburn Pre-School has been finished and installed. The children gathered around enthusiastically to see what was happening during the installation process and are all very excited. The brightly colored picturesque carving adorns the wall as they enter the school and will certainly be a great welcome as they arrive. 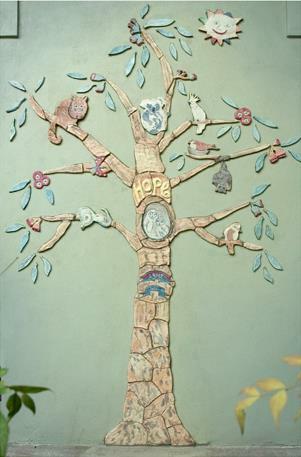 Today the fabulous Bodhi tree ceramic mural made with the Dharma club children and parents at the Tara Institute Buddhist Center was launched. I unveiled the mural which then received a special blessing from several of the Buddhist monks. My thanks to the community for making me so welcomed and especially to Jenny, Grace, Claire, Miles and Tess for all there help in the making of this magnificent tree. This was a heart felt project for me and a great honor to be a part of such a wonderful creation and community. 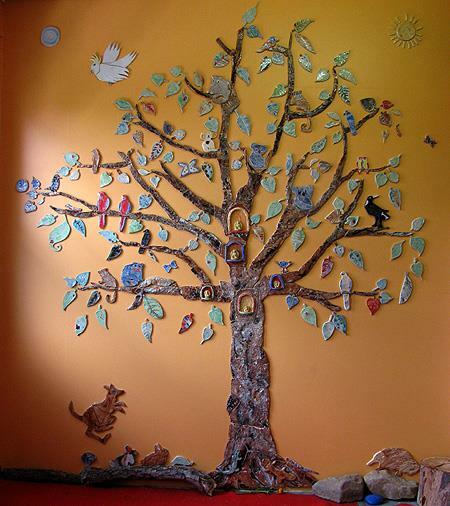 Through a chance and fortuitous meeting recently I had a fantastic opportunity to create a ceramic mural of a Bodhi tree with children and parents at the Tara Institute Buddhist Center. On my first visit I explained and demonstrated the processes we were going to use, the children then drew pictures and cut them out sticking them on a life size drawing of the tree on the wall to get a sense of how and what we were going to make. A month later I returned for our creative making day along with about sixty children and parents. 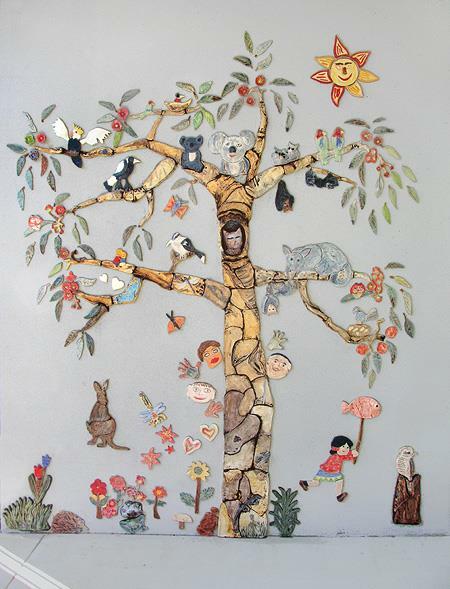 In about a four hour session we created all the pieces that went together to make a magnificent colorful tree full of animals, birds and leaves. There are several shrines in bedded in the trunk that when finished will house sculptures of the Buddha. The tree will adorn the walls of the Dharma Club a space were children from ages 4 to 15 gather monthly for fun activities and to learn about a healthy life. Below is a picture of the tree before we added the leaves and I will post a picture of the finished tree soon. Wow! This mural really adds color and life to the flat grey exterior of this building. I was commissioned to create a large ceramic wall mural with participants and staff at MacKillop Family Services in Footscray. The project really has had a fantastic outcome and everyone involved seems to be happy with it. The mural now adorns the outside wall adding a colorful and playful view to the community room. Most of the mural was made during a week long workshop in January and then finished off during a number of extra sessions with interested participants and staff. I really enjoyed facilitating this workshop and would like to thank all those who took part in its creation and supported the process.